I put a lot of effort into today's 30 Days Wild. I rather like to exercise outside when the weather is nice, but it's usually limited to yoga out on the decking. Today, however, I did a proper workout outside and it was...a little strange. It was way out of my comfort zone, in truth. I'm confident in my yoga practise so I'm not fussed if people see me, but the decking is hidden from the neighbours anyway so no one would see me even if they tried. Out on the grass in my back garden is another story, though they'd still have to be peering out of the windows or making an effort to look over the fence to see. But still, it was unusual. Though the smell of fresh cut grass was extremely pleasant, I admit, and the odd breeze was much appreciated. I may have said 'thank you' to the wind a few times. But I did say I put effort into today's 30 Days Wild, and that means more than just going outside and jumping around in the garden. I put together a wild workout especially for 30 Days Wild. And it is awesome. 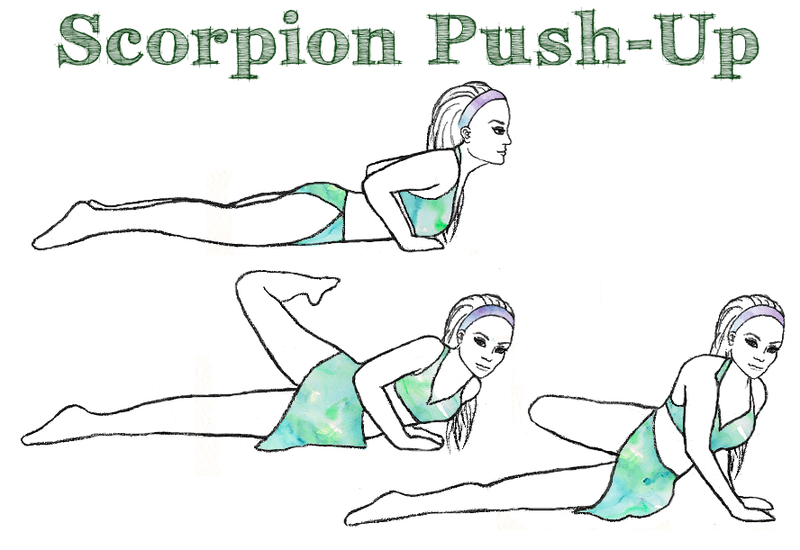 The 8 moves and 2 stretches are inspired by the movements of wild animals - bears, scorpions, iguanas and so on - and that alone makes them quite interesting to perform, rather than your typical push ups, burpees and lunges. You can really feel the animals in the movements and it's quite fun if, like me, you like to play pretend, so I really enjoyed the workout even though it was much harder than I'd expected. I'm dead pleased with the collection of moves I was able to gather up for it, too. I didn't expect to find as many as I did. This is a great body weight/cardio workout with a wild twist, and it works your whole body from your shoulders to your legs including your triceps, obliques, core, chest and bum. I've also put together beginner modifications for some of the harder moves so everyone should be able to do it. So grab a bottle of water and go outside when the sun is shining and give this workout a go - you'll be dripping with sweat and exhausted at the end, but you'll feel so, so good for it. This workout takes no equipment, just your own body weight, and one 8-rep circuit takes about 5 minutes. To complete one circuit: perform one set of each move with 20 seconds of rest between changing moves. Beginners should perform 8 reps per set, intermediate 12 reps and advanced 15 reps. Complete the circuit 1-3 times. Lower yourself into a deep squat and shift your weight forwards onto your palms, fingers pointing forwards. Move your weight completely onto your palms and in a big movement jump both feet up then forwards so that they're just in front of your hands. Shift your weight onto the balls of your feet and move your hands forwards a step to return to your start position. This is 1 rep.
Place your palms on the floor parallel to your shoulders, arms straight and extend your legs behind you in a slightly bent-knee plank. Root your palms to the floor and jump your knees into your chest, then kick your legs straight out and up behind you. Land in your start position. This is 1 rep.
Make it easier: don't try to kick your legs straight out, just tuck-jump and lift your bum in the air as if about to kick, knees at your chest. Start on your hands and knees, then raise your knees up an inch above the ground. Move forwards, left hand right leg, right hand left leg, keeping your knees an inch above the ground. Move forwards 4 steps, then backwards 4 steps. This is 1 rep.
Start in a plank position on your hands and toes. Move your left hand forwards and your right leg forwards so that your right knee is near your right elbow, pointing outwards, toes on the ground. 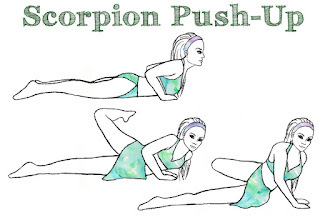 Do a single push-up in this position. Move your right hand forwards and your left leg forwards, bringing your knee behind your left elbow, pointing outwards, toes on the ground. Do another push up on this side. This is 1 rep.
Start standing with your feet just outside shoulder width and press your palms together at your chest, engaging your chest muscles. 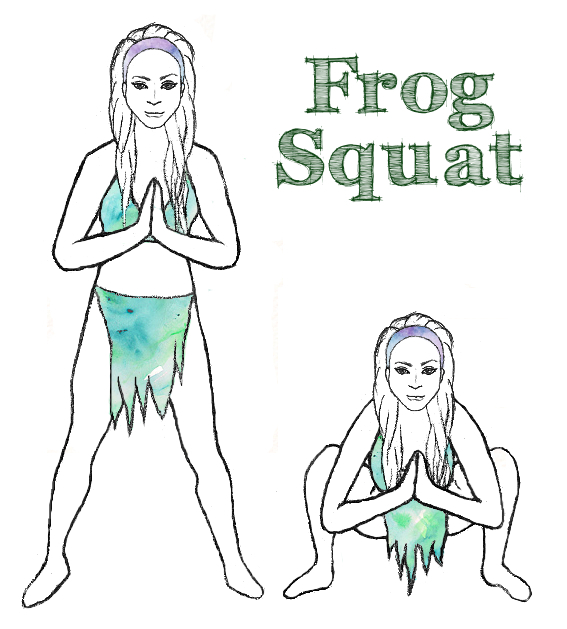 Drop down into a deep squat, keeping your knees behind your toes and your chest lifted. Rise to stand again. This is 1 rep.
Make it easier: don't go as deep into the squat. Make it harder: rather than push yourself back to your feet, launch yourself up into a jump. Don't lock your legs when you land, instead drop straight back into your squat, keeping your legs and knees flexible like a spring. Keep your chest lifted and knees behind your toes. 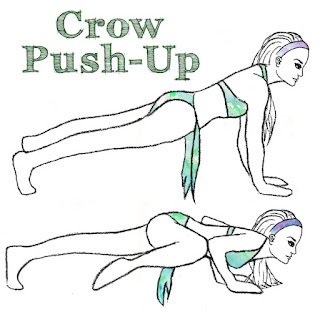 Lift your left leg and bring your knee to your elbow, keeping your foot off the ground and do a single push-up. Move your leg straight back behind you and return to your start position. Lift your right leg and repeat on this side. This is 1 rep.
Make it easier: instead of starting and performing the move on your toes, drop to your knees and perform your sets this way instead. Stand upright and press your hands and forearms together in front of your chest. Move your weight onto one leg and, while dropping into a one-legged half-squat, tuck the knee of your lifted leg and your arms into your chest, keeping your core tight for balance. Keep your back flat and your chest lifted. Steady yourself, moving slowly if you have to, open your arms and extend them to your sides and behind you and extend your lifted leg out behind you at the same time, lifting so that you feel it in your glute and hamstring. 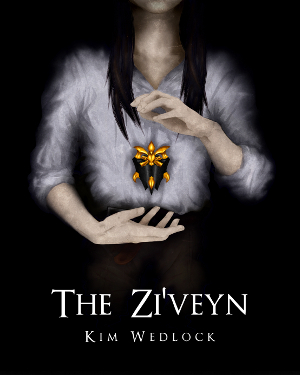 Keep your chest lifted. Return to your tucked squat position. This is 1 rep. Complete your allotted reps on one side, then again on the other. 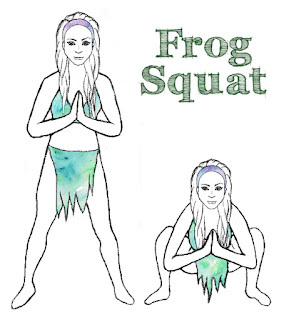 Make it easier: tap your foot on the floor between tucking and extending to help steady yourself, don't drop as deep into the squat, keep one hand on the back of a chair - do any or all of these variations if you need to, gradually working up to the full version as your strength and balance improves. 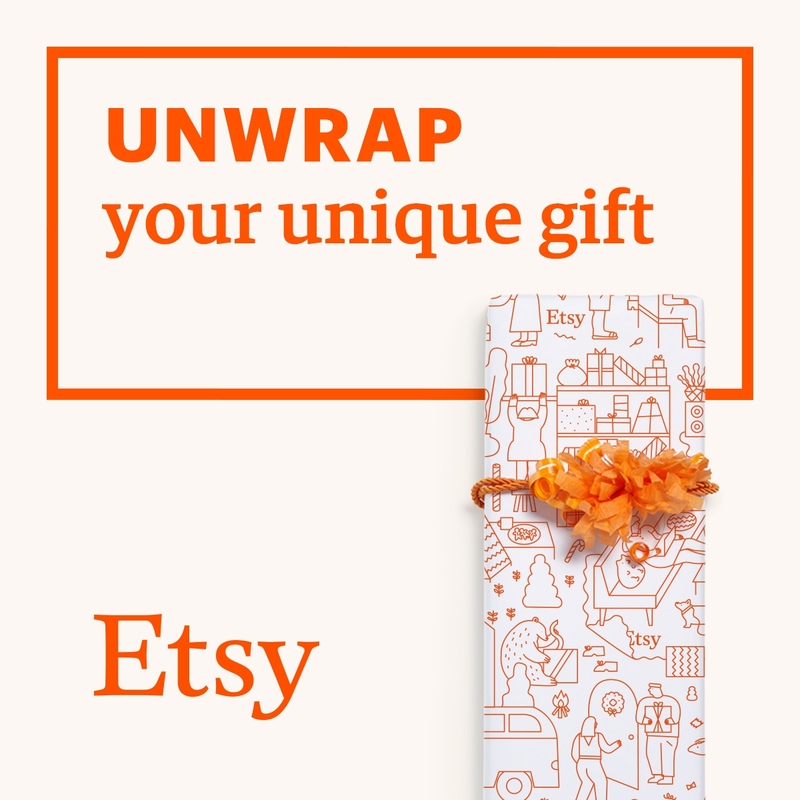 Start lying on your stomach, hands beneath your shoulders, elbows pointing back, not out. 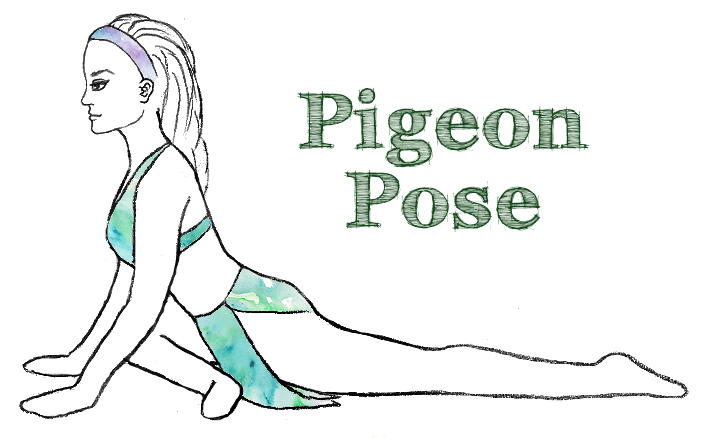 Lift your right leg to a 90 degree angle and open your hip and knee to tap the toes of your right foot on the ground on your left side, twisting through your lower back to reach across. 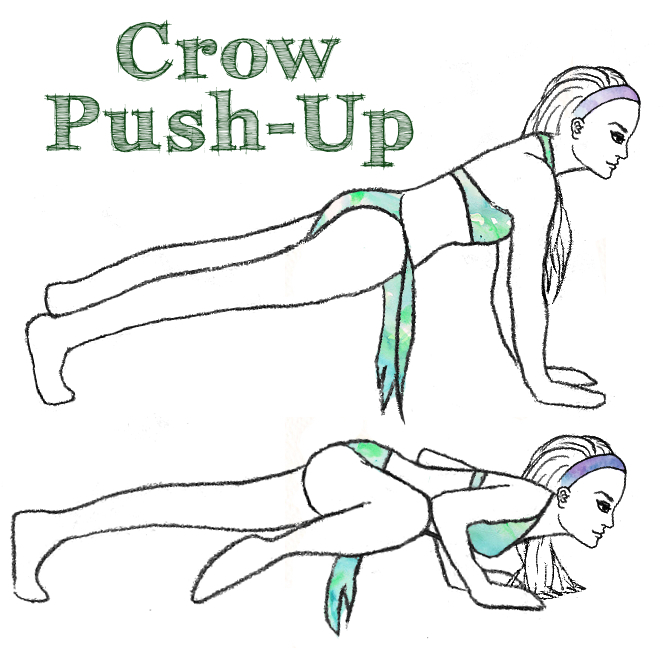 Lift your body from the ground to perform a tricep push-up as you twist. Bring your leg back around while lowering your body back to the ground. 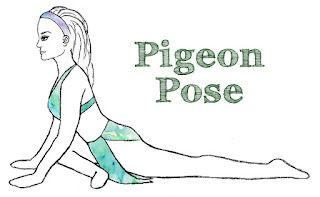 Touch your hip to the ground, then your knee, then your toes. Repeat on the opposite side. 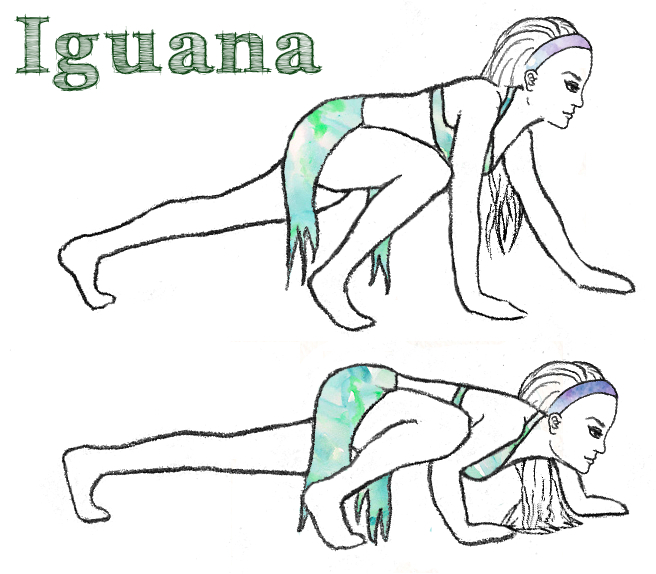 This is 1 rep.
Start in a plank position on your hands and toes, then bring your right leg up and plant your lower right leg across the mat in front of you, keeping your left leg straight out behind you. Don't force the movement - if you can't get your lower leg horizontal in front of you and you have to bend your knee more, do it. Keep your hips square to the ground, don't twist your torso. Lean forwards onto your hands if you feel a strain. If you can move deeper into the stretch, come down onto your forearms to open your hips further. If you can move deeper still, extend your arms out in front of you and rest your forehead on the ground, lying over your lower leg. Hold for 8 deep breaths then switch sides. Hold for 8 more breaths. This is 1 set. 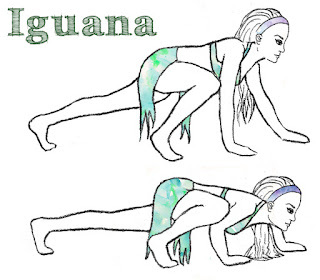 Start in a plank position on your hands and toes, hands beneath your shoulders. 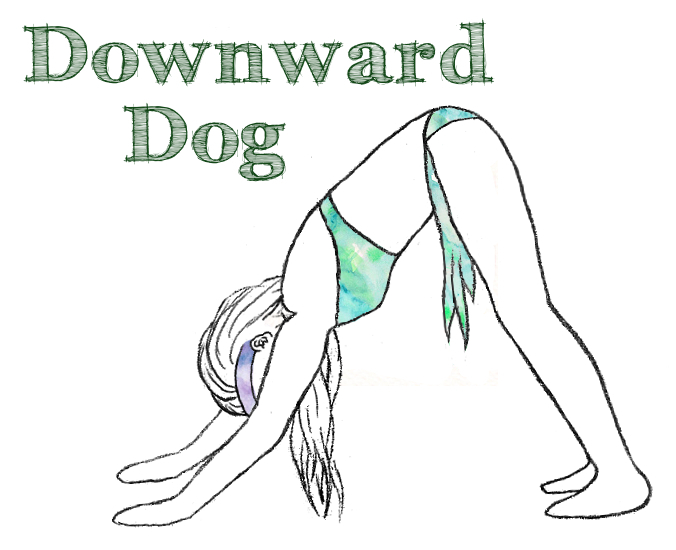 Keeping your arms straight, press your hands into the ground and push yourself back to raise your tailbone to the sky. Pull your belly button into your spine to keep your core tight and flatten your back. Hold for 8 deep breaths. This is 1 set.